Some files and directories in an Alpha Anywhere workspace can be excluded from source control. Alpha Anywhere workspaces can be stored in source control systems, such as Git. Not all files in workspace, however, need to be included. Some files and directories should be excluded either because they are user specific or are not needed -- e.g. history files can be excluded because your source control system is performing the role of tracking file history. The following is a .gitignore template for an Alpha Anywhere workspace. If you're using a public repository on a site such as GitHub, be careful not to check in information such as user names, passwords, connection strings, or API keys when committing your projects! Alpha Anywhere includes places to put information such as a Google API Key in components. Committing a component that contains the API key to a public repository makes the key visible to everyone - even if you delete it later! #replace <project> with the name of the project. E.g. "Default"
#The following files and folders are found in  a Web Project folder. #It is recommended that these files be excluded from source control. #The following files and folders are also found in a Web Project folder. # they should be unique to the component. #These are usually the same for multiple users, but may be unique. If you plan to use source control with a workspace, it is recommend to convert the workspace to use a filesystem library, which will place information such as connection strings inside a file that can be explicitly omitted from source control. This recommendation applies to desktop, web, and mobile application projects. 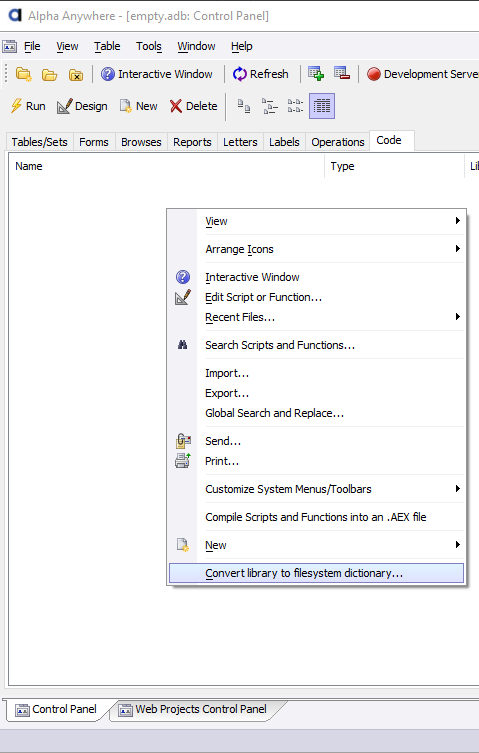 Right-click anywhere in the Code tab and select Convert library to filesystem dictionary... from the context menu. Enter any passwords that you may have for password protected scripts and functions defined on the Control Panel and click OK.
You can also perform a bulk operation to convert existing components in a project to use a JSON file format. See Change Component storage type Bulk Operation to learn more.